Summer gardening is a favorite pastime for so many. There’s nothing that compares to the relaxation and satisfaction of spending time outdoors on a mild summer day planting beds of flowers and veggies that will grow over the next few months. Most gardeners are also aware of pesky insects that can wreak havoc on their crop and are usually prepared with treatments and preventives to allow their plants to grow fruitfully. However, one sneaky visitor that you may not suspect may be behind your dug up flower beds: your dog. 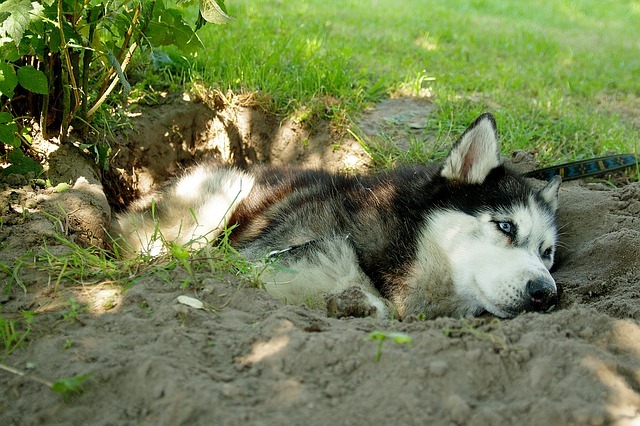 Most dogs love to dig. Even if it’s not your garden, chances are if they are outside long enough and realize the soft earth beneath them can be burrowed, they’ll start pawing away. This, like chewing, is a sign of boredom. Just as with chewing on things, you’ll need to reinforce behaviors and use proper training tactics with your dog to get him to stop digging. You’ll also want to keep your dog on an exercise schedule including two walks per day to ensure they are exerting needed energy. In addition to supervising your dog while outdoors, you can also create a dedicated “play area.” Somewhere they know is the spot they should go to while outdoors. This area should be filled with toys, stuff to chew on, and maybe some sand or other fun things. It may be just the thing you need to keep your pup too occupied to even notice the garden on the other side. If you’re dog sees a garden bed as an area to lay and roll around in, you might have to come up with some more clever ways to keep him out. Consider lining the garden with plants that have thorny brush – like roses. Dogs will not go near them once they sense the danger. You can also play into their senses and line the perimeter of the garden beds with fragrant flowers that typically keep animals away. Probably one of the main reasons to keep your dog out of your flowers however is because of the potential to ingest plants that could be toxic if eaten. Another natural spray you can make at home to deter your dog from your garden includes a mix of water, red pepper and powdered mustard. If your dog is persistent though, you can always resort to various fence options for either the garden area or the yard as a whole to give you the peace of mind you need to enjoy your backyard again. If you’re in the Western Massachusetts area, an invisible electric dog fence from DogWatch of Western Mass might be a great choice for you. DogWatch hidden fences are a safe, affordable, and effective way to contain pets within your yard and out of areas you deem off-limits. There’s still time to get your garden going for the upcoming summer season so start planting today!